Click here for audio of Episode 1620. Today, birch-bark canoes. The University of Houston's College of Engineering presents this series about the machines that make our civilization run, and the people whose ingenuity created them. The first Europeans in the Western hemisphere had only to look around them to find new ways of doing things. For example, North America has a vast network of lakes and rivers, and Native Americans had created the Indian canoe to make use of that resource. Now and then we find a technology that does much more than just catch on. Some ideas are so right that people improve them until they fit their purpose perfectly and finally accept almost no further improvement. The Indian canoe is one such technology. Minnesota, my childhood home, is called the Land of 10,000 Lakes, and all those lakes have canoes on them. Nowadays, most are made of aluminum or fiberglass, with polystyrene floats in the bow and stern. But their form is still identical with the Indian birch-bark canoe. Native Americans kept little that we can call written records, and, since canoes were completely biodegradable, we have no archaeological remains either. Our earliest records of canoes are sketches left by the first European explorers. They show this ancient craft only fluctuating about one nearly perfect design. Canoes are shallow-draft boats whose delicate shape has much in common with Viking ships. One advantage over a rowboat is that the paddler faces the direction of travel. Most canoes were small, light, and fast -- meant to carry a few people rapidly over our rivers and lakes. The Iroquois built big thirty-foot-long freight-carrying canoes that held 18 passengers or a ton of merchandise. Emptied, even those canoes could be portaged by just three people. The old canoes had tough light wooden frames with a skin of bark, usually birch. Sometimes the bark was put on in one piece and pleated to take up slack as it was contoured. Sometimes it was sewn in sections and caulked with spruce gum. Material selection, sewing, binding, and carving were all sophisticated. Designs varied among tribes, according to local conditions. 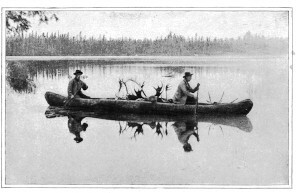 Even kayaks in the far North , covered with animal skin instead of bark, reflected the same underlying principles of shape and propulsion. Longfellow, fascinated by this art, devoted a whole chapter of his Song of Hiawatha to Hiawatha's building of a canoe. Like a yellow water lily! Now and then, we reach a sort of dead-end functional perfection. That's far from true of our new electronic media. But it is true of most commonplace technology that we've accepted. By 1840 we'd created a style of wooden house construction in North America that changes little in a high-tech world. Our automobiles have long since ceased to change radically from year to year. And, like the automobile, the design of the North American Indian canoe is one we tinker with but do not alter radically. It is an American icon precisely because it has reached a point that appears to defy improvement. For more on canoes, you might well begin with the Encyclopaedia Britannica article on them. For more on the Aleut kayak, see the excellent book by Dyson, G., Baidarka: The Kayak. Anchorage: Alaska Northwest Books, 1986. This is a greatly reworked version of Episode 161.